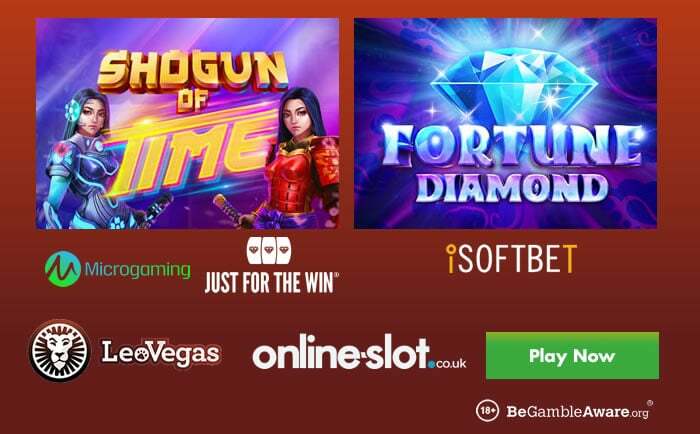 Both iSoftBet and Just For The Win have released new slots – read about Fortune Diamond and Shogun of Time as well as where best to play right now. Fortune Diamond is powered by iSoftBet and feels like a classic fruit machine with a Chinese theme. Colourful yet simple, the 5 reel, 50 payline slot is all about the wilds which benefit from multipliers up to 10x. This really adds excitement in the Free Spins feature where up to 100 free spins can be won in total. If you triggered the feature with a wild of 10x, that multiplier will be in play throughout every single free spin – this could lead to wins of 20,000 times your stake on each free spin. Check out the full Fortune Diamond slot review where you can play for free. Shogun of Time is brought to you by Just For The Win and Microgaming – with 4 reels and 81 paylines, you are taken to cyber-punk Japan. With a futuristic feel, 4 of a kind winning combinations will trigger the Reel Split Re-spin feature where a 5th reel comes into play. The other 4 reels lock in place with the 5th reel re-spinning – this allows for enhanced winning combinations. There’s also a Free Spins feature where you can win up to 16 free spins on a 5 reel, 243 ways to win machine – the middle reel is wild throughout which helps. This allows for payouts of 2,717 times your stake on each free – visit the Shogun of Time slot review for more info. You can play both Fortune Diamond and Shogun of Time at LeoVegas Casino – they also have other new titles like Novomatic’s Feather Frenzy and Quickspin’s Ticket to the Stars. In fact, they have nearly 1,200! With numerous industry awards under their belt, they are giving away £40,000 in cash in their latest promotion.